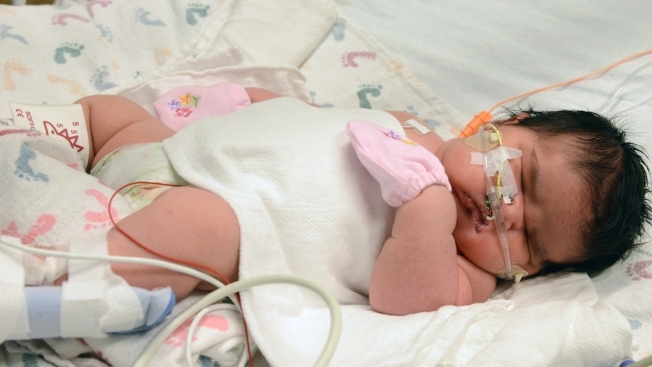 This image provided by Children’s Hospital Colorado shows Mia Yasmin Garcia shortly after birth Dec. 2, 2014 she was born by cesarean section in Alamosa, Colorado Monday, weighing 13 pounds, 13 ounces. A woman in southern Colorado was surprised when she gave birth to a baby girl that tipped the scales at almost 14 pounds. Mia Yasmin Garcia was born by cesarean section in Alamosa on Monday, weighing 13 pounds, 13 ounces. The Alamosa Valley Courier reports the newborn was flown to a Denver-area hospital because she had low glucose levels and trouble breathing. KUSA-TV in Denver reports her mother, Alisha Hernandez, was expecting a 7-pound baby. Mia's father, Francisco Garcia, says the newborn's size shocked everyone, including hospital staff. He says "they were like whoa! They opened their eyes like they've never seen a baby like that." Mia is being welcomed by four older sisters.